In 2004, a substantial cache of Shostakovich autographs, sketches, and rejected drafts was discovered in a Moscow archive by the scholar Olga Digonskaya. While much of the new material helps to illuminate the compositional process behind well-known works, undoubtedly the most sensational find was music intended for an operatic satire dating from the early 1930s, titled Orango, that never saw the light of day. The opera was commissioned by the Bolshoi Theater in 1932 for the purpose of commemorating the 15th anniversary of the Revolution. Alexei Tolstoy and Alexander Starchakov signed on as librettists to compose an opera with Shostakovich on the broad theme "human growth during revolution and socialist construction." Ultimately, the collaborators conceived their opera as "a political lampoon against the bourgeois press," adapting the plot from one of Starchakov's stories concerning a human-ape hybrid conceived in a medical experiment. What doomed the project were the tight deadlines. 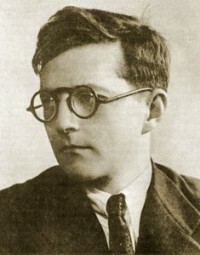 The librettists failed to deliver on their contracted schedule and Shostakovich had no choice but to push the composition to a back burner, eventually abandoning it. Until the recent discovery of Shostakovich's piano sketch for the opera's prologue, no one realized that Shostakovich had composed any music for the opera at all. Alexei Nikolayevich Tolstoy (1883-1945), famous Russian writer of noble descent. He sided with the Whites at the time of the Revolution, but his sympathies changed. In the 1920s he became one of the prominent artistic figures to re-emigrate to the Soviet Union, where he established himself as an elite member of the Soviet literary establishment. Alexander Osipovich Starchakov (1892-1937), Leningrad-based journalist and literary critic. He was a close friend of and regular collaborator with Alexei Tolstoy, and published about him. He was arrested in 1936 and shot the following year. The subject of animal-human hybrids had both literary and real-life precedents. H.G. Wells The Island of Doctor Moreau (1896) and Mikhail Bulgakov's Heart of a Dog (1925) number among the former. Among the latter was one drawn from the pages of the contemporary press, about research in crossbreeding by the Russian scientist Ilya Ivanov, who was sent by the Soviet government and Academy of Sciences to Africa in 1926 to carry out experiments involving the artificial insemination of female chimpanzees with human sperm. Upon his return to the Soviet Union in 1927, Ivanov continued this controversial research at a primate station in Sukhumi; while travelling in the South in 1929, Shostakovich visited the "ape farm" and recommended it as a sight worth seeing. Ilya Ivanovich Ivanov (1870-1932), biologist, specialist in artificial insemination and interspecific hybridization. As a result of a political shake-up in the Soviet scientific community, Ivanov was arrested in 1930, convicted of counterrevolutionary activity and sentenced to five years of exile, where he died of a stroke in 1932. Act I  In a scientific experiment, a French biologist impregnates a female ape with human sperm. A journalist finds out and publishes an exposé that ignites a political and religious uproar. The biologist continues his research in secret and when the ape conceives, he ships her to a colleague in South America. In due course, he learns that the ape has given birth to a male hybrid which differs little from a baby born to a woman. Correspondence between the two scientists continues until the summer of 1914, when war breaks out in Europe. Act II  One evening after the end of World War I, a stranger knocks at the French biologist's door, introducing himself as Jean Or, the adopted son of the biologist's now-deceased South American colleague. The biologist recognizes the hybrid offspring of his 20-year-old experiment, introduces him to his daughter, and offers assistance. Eventually, the young "man" finds work on a newspaper owned and edited by the very journalist who had originally exposed the scientific experiment in which he was conceived. Or(ango) flourishes, becoming involved in shady dealings, blackmail and financial speculation. He rises rapidly to become the newspaper owner's closest assistant and, ultimately, his successor. At the request of Irina Antonovna Shostakovich (the composer's widow), Gerard McBurney orchestrated the surviving piano sketches for the Prologue of Orango. Gerard McBurney (b. 1954), British composer, writer and broadcaster, a specialist in Russian and Soviet music. His credentials include arrangements of a number of Shostakovich's lesser-known theatrical scores of the period, notably a suite of incidental music to The Bedbug, op. 19 (1929), and the music-hall revue Hypothetically Murdered, op. 31 (1931). During a public meeting at Moscow's majestic Palace of Soviets, spectators extol the liberation of labor from its cursed, servile past. A Master of Ceremonies announces the next attraction: Orango, the famous human-like ape. But when finicky foreign guests demand to witness something truly amazing, he introduces instead a prima ballerina, the "eighth wonder of the world," who performs a dance of peace. Spectators now clamor to see Orango, whose attributes and talents ("he eats with a knife and fork, blows his nose, yawns, plays chizhik-pyzhik and even says 'he-he-he' ") are described by the Zoologist as he commands his docile charge to demonstrate them. Suddenly, Orango roars and rushes at the foreigner Susanna, threatening to "rrrrip" her to pieces. After the ballerina dances a taming dance, he is restrained and removed. Curiosity is piqued about Orango's background and what it is about Susanna that triggered his attack. Three foreigners come forward and introduce themselves: embryologist Armand Fleuri, Orango's creator; the embryologist's daughter René, Orango's "step-sister"; and journalist Paul Mash who identifies Orango as his former student and "a brilliant journalist." With these principals on hand  to be supplemented by members of an amateur troupe  the Master of Ceremonies now proposes a dramatization of the remarkable story of the creature through song and dance: "how the unusual hybrid Orango was born, took part in the war, returned to Paris and what he did there... went to the Soviet Union... was exposed... married... destroyed... and bought in Hamburg for 150 dollars." The crowd is eager with anticipation. The Prologue consists of 11 numbers, lasting approximately 40 minutes. No. 1 (overture) and No. 5 (part of the ballerina's "dance of peace") were interpolated from Shostakovich's second ballet, Bolt, withdrawn after its unsuccessful premiere in 1931. Shostakovich also adapted music from the music hall revue, Declared Dead (aka Hypothetically Murdered; 1931) and there are stylistic intersections with other scores he was working on during the period, most notably the opera Lady Macbeth of the Mtsensk District (1930-32). Gerard McBurney, "Some Frequently-Asked Questions About Shostakovich's 'Orango'," Tempo (2010), vol. 64, issue 254, pp. 38-40. Olga Digonskaya, "Interrupted Masterpiece: Shostakovich's Unfinished Opera Orango. History and Interpretation," Shostakovich Studies 2, ed. by Pauline Fairclough (Cambridge: Cambridge University Press, 2010), pp. 7-33. Olga Digonskaya, "D.D. 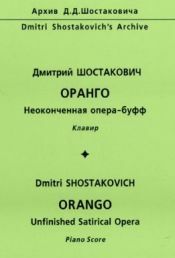 Shostakovich's Unfinished Opera Orango, introductory essay in piano score (Moscow: DSCH Publishers, 2010), pp. 31-58.
humans with anthropoid apes," Science in Context vol. 15 no. 2 (2002), pp. 277-316.